Soon and Very Soon - Written By Andrae Crouch, this spiritual shows the softer side of the Orpheus. Aberystwyth - This traditional hymn tune by Dr Joseph Parry, arranged by Dr Alwyn Humphreys sung in Welsh and English sums up the feeling of returing to God at time of death -"Cover my defenceless head, with the shadow of thy wing." En Route - A re-recording of the track first recorded in the 1973 recording with the Band of the Welsh Guards of the same name. Revived for our 75th Anniversary year. 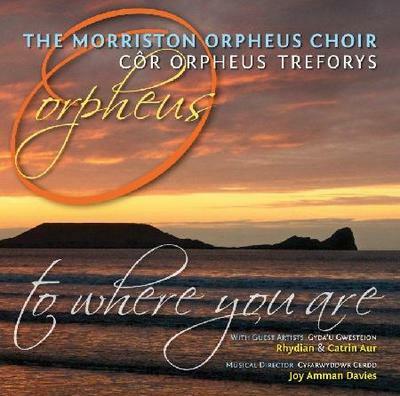 To Where You Are - The title track of the CD holds a very special meaning for the Orpheus being very comforting to those experiencing the loss of someone special. "Who can say for certain? Maybe you're still here, I feel you all around me, your memory's so clear"
The Easter Hymn - Cavalleria Rusticana - The rousing and dramatic "Easter Hymn" features the second of our soloist's 2009 MOCSA competition winner Catrin Aur. A lady with a big future. Stand by Me - Another memory from the past. A plea for support when under pressure, the claming "Stand by Me" is an ever popular favourite. Sunshine in My Soul - Another uplifting track showing the lighter side of the Orpheus. How Great Thou Art - This evergreen hymn is alway popular with young and old alike, recently voted one of the nation's favourite hymns - never better than when sung by the Orpheus in full voice. Bui Doi - The second piece featuring Rhydian. Literally translated as the "Dust of Life" about the street children of - Vientam following the Vietnam war, potentially the most emotionally charged piece of the recording. Mansions of the Lord - This the title track from the 2002 film "We Were Soldiers" ...Fathers, Brothers, Husbands, Sons. A reminder of the people behind the soldiers. Mor Hawddgar Yw Dy Bebyll - A setting of Psalm 84 "How Lovely Are Thy Dwellings" composed by the South West Wales Composer Eric Jones and originally arranged by him for the Orpheus. A Red Red Rose - An unusual setting of the words of Robbie Burns, suited perfectly to the sound of the MOC. You'll Never Walk Alone - The final piece featuring Rhydian, the words of which require no explanation. Canwn Moliannwn - A medley of four Welsh hymn tunes arranged for the 75th Anniversary by Joy Amman Davies. This selection culminates in the rousing "Craig Y Oesoedd" The perfect ending.